As Al-CIA-da become the “good guys” (again), and I-CIA-SIS starts to crumble, and the latest boogeymen fail to strike a chord of panic in a boogeyman-weary public (remember the fearsome Khorasan Group, anyone? ), it is safe to say that the old Global War on Terror (GWoT) paradigm is falling by the wayside. Lucky for the multi-trillion-dollar global terror-industrial complex, then, that the spiffy new _cyber_terror paradigm is waiting in the wings to take its place! The GWoT and all of its attendant ills have been built on the back of that “catalyzing event”— our “new Pearl Harbor,” 9/11. So, naturally, the new cybersecurity establishment is waiting breathlessly for the “cyber 9/11” that will justify the complete crackdown and government takeover of the internet. Unsurprisingly, the “cyber 9/11” meme stretches back almost to 9/11 itself. Back in 2003, even as the Pentagon was feverishly drafting its plans to “fight the net” as if it were “an enemy weapons system,” Mike McConnell, the ex-director of the National Security Agency (NSA), was fearmongering over the possibility of a cyber attack “equivalent to the attack on the World Trade Center” if a new institution were not created to oversee cybersecurity. Since then, report after report has continued to use the horror of 9/11 as a way of fueling public hysteria over cyberterrorism. Of course, many of you reading this editorial will already know the reason for the cyberterror frenzy: There is a pre-planned solution waiting in the wings to be revealed to the public after they have been prompted to respond to the next (virtual) false flag provocation. We don’t have to speculate on this point. In 2008, Harvard law professor Lawrence Lessig told a technology conference that a cyber equivalent of the Constitution-destroying Patriot Act is on the shelf, ready to be rubber stamped into law. All it requires is a “cyber 9/11” to make such legislation politically viable. In effect, the advisors, agents and experts in the cybersecurity industry are waiting for a spectacular cyberterror attack to justify a crackdown on the internet. Their plans include “identity management” schemes like fingerprinting for internet access, which would put an end to the free internet. So if we know the psychopaths in power need a cyber 9/11 to spring their iPatriot Act on the internet, the obvious questions are: Would the US and its cronies really do something like this? And who would be blamed? The first question is easy enough to answer: Yes. Yes, they would do this. Case in point: Stuxnet. Stuxnet was a computer worm that the US and Israel jointly created to target Iran’s uranium enrichment facilities at Natanz. And as we have since learned, Stuxnet was only one part of a much larger cyberattack against Iran, jointly launched by the US and Israel and dubbed “NITRO ZEUS.” Although Stuxnet was intended to be the cyber equivalent of a precision-guided bomb, only capable of damaging the specific computer systems it was intended to target, it quickly escaped the computer systems at Natanz and spread across the internet. Oops. Hope that kind of cyberweaponry doesn’t end up in the hands of one of our “enemies.” That might lead to a cyber 9/11! And wouldn’t you know it? Other attempts to contain the tools in the Pentagon’s cyber-armory have been similarly unsuccessful. In 2016 it was revealed that the NSA had not only found security vulnerabilities in numerous software and hardware products but, in direct contradiction to its earlier assurances, had failed to inform the vendors of these problems so they could properly secure their product. Instead, the NSA has been hoarding those exploits so it can gain backdoor access to the computer systems of targeted governments and individuals. As cybersecurity researchers warned at the time, this practice ultimately increases the likelihood that these vulnerabilities will be discovered by criminals, hackers and terrorists somewhere down the line. With the spread of the WannaCry ransomware of 2017, itself made possible by an exploit stolen from the NSA, these fears were realized. Boy, sure hope this technology doesn’t end up in the hands of the enemies! They might use it to inflict a Cyber Pearl Harbor attack on us! And who are the enemies, exactly? Why, the Russians, of course! It’s the Russians! It’s always the Russians! Did you stub your toe on a chair this morning? The Russians rearranged your furniture while you were sleeping! Only mismatched socks left in your sock drawer? That’s because the Russians were rummaging through there last night! And if you get hacked? Well you better believe that’s the Russians! In fact, even if you don’t get hacked, you can just say it was Russian hackers, and millions will believe you unquestioningly. Just ask Hillary and the DNC. As we’ve already seen, the “intelligence reports” that have been released so far detailing Russian “election hacking” have been completely evidence-free exercises in political mendacity (but I repeat myself). In fact, we’re not even taking the intelligence agencies’ word for it, because they are taking the DNC’s word for it. Never forget: The DNC refused to hand over its servers to the FBI for examination. Now, to be fair, it is possible to imagine a universe without contradiction in which the Russians hacked into the DNC to expose their emails to the world. I mean, there’s no evidence whatsoever that that’s what happened, but it’s not impossible to imagine it happening. 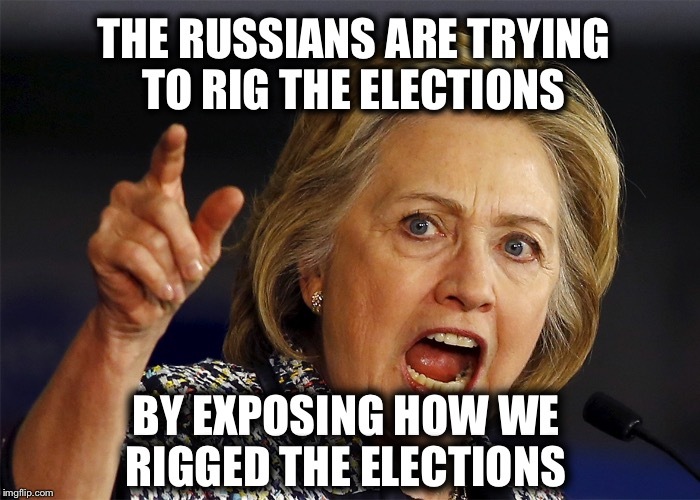 However, as the meme-sphere has rightly pointed out, even if that did happen, it only means that the Russians rigged the election by exposing how the DNC rigged the election. Hmmm…seems the “I’m Still With Her” crowd haven’t quite thought this one through. Of course, this isn’t about only the DNC hack or the Podesta spearphishing. Rather, this is a now-familiar cycle in which the #fakenews MSM identifies a hack, worm or cyberattack, immediately blames the Russians in ALL CAPS headlines on the front page, and buries the inevitable retraction in small print at the bottom of page B27 (or the internet equivalent thereof). If you think I’m joking, read MoonOfAlabama’s excellent summary of how this has happened over and over and over and over and over again in the past year. But as ludicrous as the neo-McCarthyite hysteria has become in recent months, perhaps it reached peak pitch last month in the Qatar crisis. Readers of my column about that crisis will remember how this latest spat in the Gulf (ostensibly) started: The Qatari Emir threw shade at the UAE, Bahrain, Egypt and the Saudis, accusing them of smearing the Qataris and their Muslim Brotherhood/Iranian/Hamas/Hezbollah allies and friends. Or at least that’s what was reported in a curious little piece on the Qatari News Agency website—a piece that was yanked down within half an hour. The Qataris’ immediate explanation for this swiftly-retracted report? Hackers had broken in and planted the story on their site. Things being what they are, the FBI immediately turned around and blamed those dastardly Russian hackers, and the government’s lapdog MSM dutifully regurgitated this unproven assertion without challenge. The Russians? The Russians planted a fake news story on the QNA website in order to get the Saudis mad at the Qataris? Really? No, not really. I know you’re not going to believe this, but the self-same FBI that so confidently pointed the finger at Russia now believes with absolute confidence that it was in fact the UAE that hacked the QNA site. I mean, let’s be clear: The feds are probably wrong about this assertion, too, but it just goes to show how seriously we should take their finger-pointing. All this flipflopping raises the question of how the FBI—or the CIA, for that matter—determines culpability for a cyber attack in the first place. There are a number of methods for doing this, of course, from the ridiculously circular (“We attributed this type of attack to Group X in the past, so it must be Group X this time!”) to the just plain ridiculous (“Look! Russian language and references to old KGB chiefs! Clearly those sneaky Russkies forgetting to hide their tracks!”). But then the CIA’s secret tool for disguising their own hacks to look like it came from another country’s government gets exposed, and we’re back to credulously taking the word of the spooks as gospel when they say they never have and never would use such a deceptive tactic (pinky swear!). If I really have to answer that question for you, you’re probably not a true Corbett Reporteer. If you do know that the intelligence agencies have lied to you, that they have created and spread cyberweapons in the past, that false flag attacks are used to blame political enemies, and that Russia is being set up to take the fall for the upcoming “Cyber 9/11,” then you’ll know what to think when you see the big New Pearl Harbor 2.0 unfolding before you. But your friends and neighbors probably won’t. Perhaps you can share some of this information with them before events unfold, so they’ll be forewarned about what’s coming. This editorial is part of The Corbett Report’s weekly subscriber newsletter. For full access to the newsletter, and to support The Corbett Report, please become a member.